Pretty new to all this so sorry if this subject has been done to death in the past, but now it's the season for night rides I was looking at good lights a while ago and couldnt believe the price. A mate lent me one of his that he uses for MX Enduro racing that he said was better than the headlight on his KTM and I couldn't believe how good they were for the price. My plan was to attach a set to my helmet and a set to my handlebars, but I found that the handle bar set was unnecessary and a set on my hemlet was more than enough which was a bonus as I now have a set for my son and a set for me so we can nightride Bedgebury together. The 8.2v 6400MaH Battery that came with it lasts about 3 hours, but I have found that you need to ensure that they're fully topped up before you go out because when the battery runs out there's no warning, you're just plunged into darkness. I've seen people pay £150 - £200 for lights, but with these X2's at £15ish I can't understand why anyone would...even if my lights only last a year and I relace them every year it'd still be worth it. Here's a vid I made when I was testing out my mates lights with him, he's the one in orange and is using the SolarStorm X2. It's not the best vid quality as it was my first go with the Garmin VIRB as well and the camera obviously focuses on the lightest spot and doesnt give a true idea of the full extent of the beam, but worth noting the shadow I cast when he's behind me. They look pretty good, and definitely worth a punt at £15! 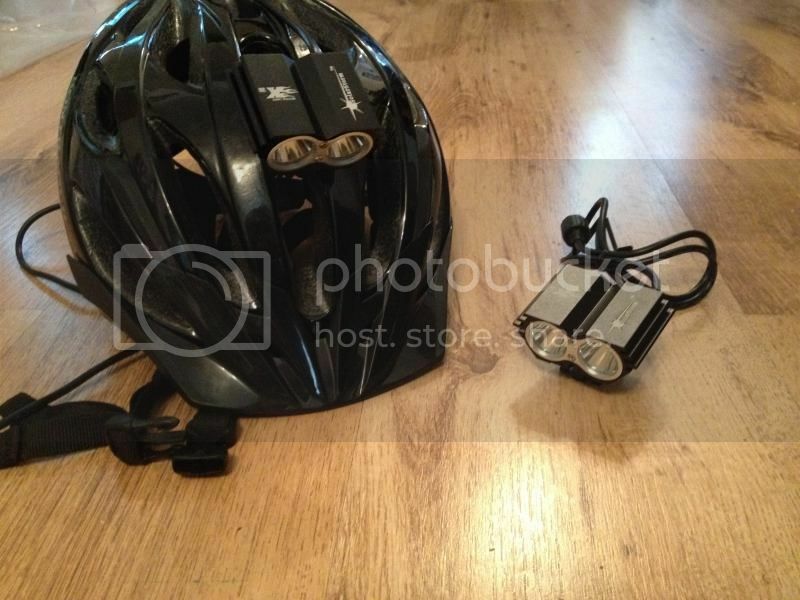 I need a new helmet light as having my Hope 4 on my noggin is a bit ridiculous realy as it is massive, so want to return it to it's rightful place on the bars. Let us know how you get on with it. Looking at the price of those Hope lights, I'd say it's defiantely worth a punt. jonboy1066 Wrote: Looking at the price of those Hope lights, I'd say it's defiantely worth a punt. Yep, although Hope are worth the money for the lifetime warrantee though, had mine repaired twice now FOC. I have experience with cheap lights and expensive lights. My advice would be never to use a cheap light as your only light. They're fine in pairs or when supplemented with a high quality light. I've had two cheap lights die on me and leave me in the dark. I have new cheap light that I'll use to supplement my Exposure Toro if I ever get back to night riding. I regularly use the Exposure on its own for commuting. Yankee Wrote: I have experience with cheap lights and expensive lights. My advice would be never to use a cheap light as your only light. They're fine in pairs or when supplemented with a high quality light. I've had two cheap lights die on me and leave me in the dark. I have new cheap light that I'll use to supplement my Exposure Toro if I ever get back to night riding. I regularly use the Exposure on its own for commuting. I don't need Blackers for an Oldbury ride, day or night, so you'll have to pester him yourself. I can't speak for him, but I've certainly been put off night riding by my experience with the General's broken neck crash. That was 2 years ago, and I've only been on a couple of night rides since. I have a set of the Solarstorm lights from ebay & also a set of Cree X6 lights off ebay. I have to say the Cree one is a better more powerful light. I bought the solarstorm one as after about 4months my Cree decided to not work on single light setting which would last for 3hrs & instead only on the 2 & 3 bulb settings. They would last 90min then die with no warning! I hoep to be getting hold of some more expensive Azonic lights & will be testing & comparing them to my cheap ebay lights in due course.